If you want to keep bath products in order and located at all times you can use baskets and boxes of different sizes for storage and thus have the clear bathroom. The bathroom is one of the areas of the home that we must address both more hygienic as aesthetics. 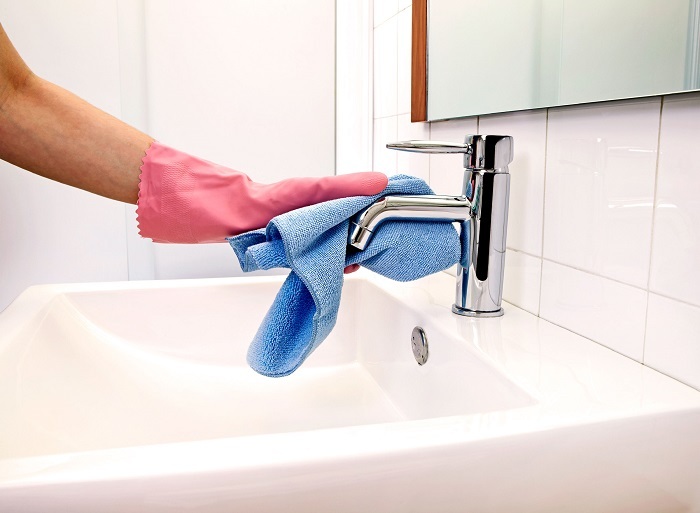 No matter how big or small, there are a number of cleaning routines that we apply every day to keep sanitized and under the right conditions. To this end, most use harsh chemicals, knowing that there are green options that can be as or more effective. In addition, some are complicated love him to order without knowing how to maximize each of its corners. We understand that perform these tasks is not always easy, and then we share 13 sure-fire tricks to organize it and leave it spotless. 1) Use storage containers: If you have very little space for small objects organize your bathroom, paste some storage containers in the cabinet door and put them there. 2) Create an organizer of towels: In the absence of a drawer or shelf to put the towels, you can create a fun organizer with milk cans and decorative paper. 3) Put towel rails in the door: Take the back door to put practical towel rails. This will help you save space and everything will look better. 4) Make an organizer with bottles: Another good idea to put small objects is placing several glass jars on a wooden board attached to the wall. These give a different design and keep everything in order. 5) Shelf hidden: In the cabinet door of the bathroom can be calculated some steps to a hidden ledge practice. 6) Use a rack for wine: If you have an old wine rack unused, clean it well and put it in the bathroom to put small towels. 7) Organizer perfumes and accessories: If you like to keep your perfumes and accessories in the bathroom you can do this simple shelf with some dishes and old glasses. 8) To save your tweezers and dryers: Paste some PVC pipes in the bathroom cabinet door and use them to store tweezers, irons and dryers for hair. 9) Use baskets: The advantage of using baskets in the bathroom is that they are very decorative and are used to store almost anything. The can put on the wall or shelf or mode, for example, under the sink. 10) Disinfects and whitens the toilet: The toilet should be cleaned every day to reduce the presence of bacteria and dirt that accumulates. Instead of using chlorine and chemical detergents, prepare your own homemade product thanks to the properties of the bicarbonate. Mix all ingredients in a bowl and spreading the product on the surface of the toilet. Then gently brush and rub with a cloth. You can also use this solution to remove mold from the tub and walls. 11) Remove the mold from the curtains: The mold is not only unpleasant, but it smells bad and can cause respiratory problems. To eliminate that accumulates in the curtains do not hesitate to try this trick. Diluted white vinegar in two cups of water and add lemon juice. Spray the product in the shade and rub with a brush. Remove the excess and put it to dry in a ventilated place. 12) Brills taps: The shower faucets and sinks begin to look dull by the accumulation of moisture, chemical residues and lime. To leave them as new and free from bacteria uses the qualities of hydrogen peroxide. Hydrogen peroxide diluted with water and pour coffee in a spray bottle. Spray taps and wash a clean cloth. 13) Clean the tiles: Dirt and fungus bathroom tiles can be removed thanks to the properties of white vinegar. These products leaves clean and prevent unpleasant odors occur. Dampen the cloth with white vinegar and rub hard tiles. If notes are too dirty, apply with a brush. As you may notice, you do not need to invest too much to leave the bathroom clean and harmonized. Just use your creativity and take advantage of the materials you have at home.